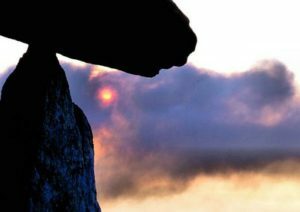 There is a certain sense of ancient grace present at Pentre Ifan. 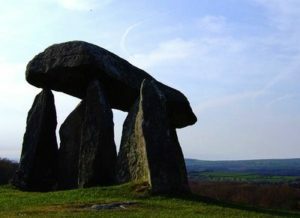 Allied with its brooding air of myth and magic, it is unsuprising to discover that this is the most popular megalithic site in Wales. 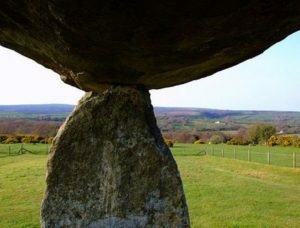 The tomb’s incredibly massive five metre long capstone weighs in at over sixteen tons but appears almost delicately held, eight feet clear of the ground, upon three gnarled and tapered supports. Appearing to all that the whole monument might collapse at any moment, it is easy for the visitor to wonder upon what supernatural intervention might be at work preventing it from all crashing to the ground. Such stirrings of the imagination are easily raised at Pentre Ifan. 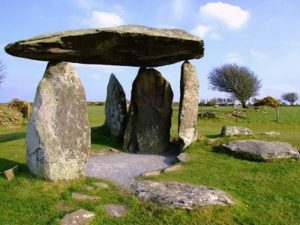 It is believed that Pentre Ifan was an important site for Druid worship in the past and evidence of more recent occult practices were discovered here during this author’s 2007 visit to the dolmen.